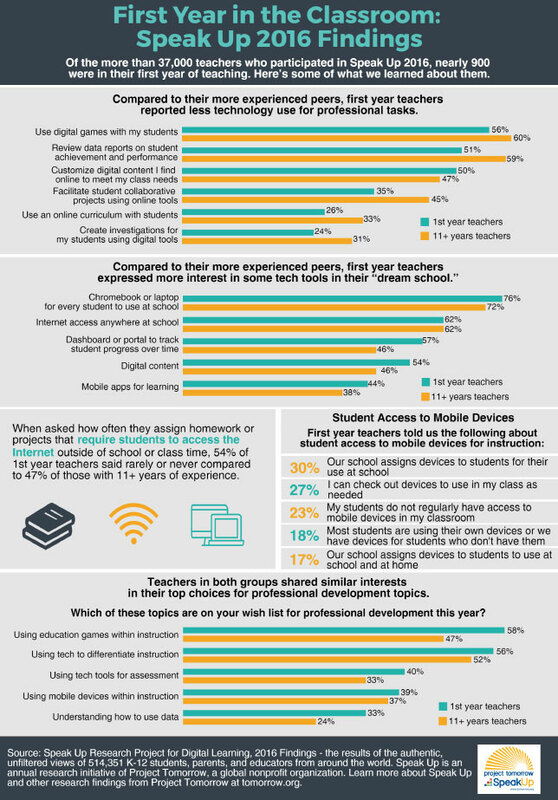 New data from a survey of more than 37,000 educators revealed that first-year teachers aren't using tech in the classroom as much as their more experienced colleagues even though they have a higher opinion of their own technological abilities. "Engage in online professional communities" (14 percent versus 24 percent). The one category where first years outdid more experienced teachers was "Customize digital content I find online to meet my class needs" (50 percent versus 47 percent). Thirty-four percent of first-year teachers rate their tech skills as "advanced" versus 27 percent of educators who have been working in the field for 11 or more years. The new data, along with an infographic, can be accessed on Project Tomorrow's Speak Up site.